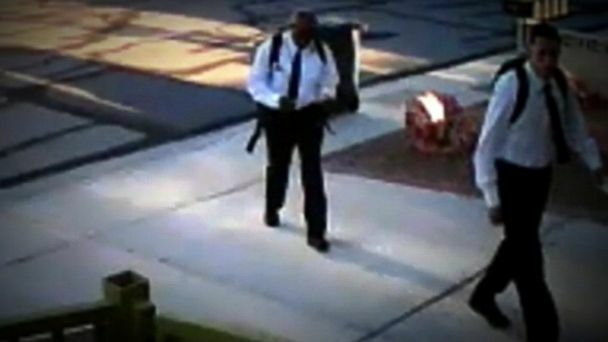 Police have released surveillance video with the hopes that someone will recognize two men apparently posing as Mormon missionaries who pulled out a gun instead of a bible before robbing a couple's home in Las Vegas. The robbery took place at about 6 a.m. June 27 when Ida and Terence Delucia say the young men knocked on their door. "They said we'd like to talk to you about Jesus Christ and they handed me a pamphlet," Terence Delucia said. These so-called men of God were far from holy, says Delucia, who was attacked at his doorstep. "When I handed the pamphlet back, something went around my neck. I screamed for my wife," he said. Delucia says the suspects beat him but he managed to wrestle both men to the ground, although it was a losing battle. "Once I was on the ground, one of them was sitting on me and I could not breathe and that's when I thought I was going to die," he said. Then, he says, they started robbing the house and made their way into the bedroom where his wife was hiding underneath clothes. "He came into the bedroom to check and he looked around, and I could see the gun," Ida Delucia said. Police say the thieves made off with $3,000 stashed in a cookie jar, three iPads and an iPod. Both men were wearing white button-down shirts, black ties, black pants and black shoes. One suspect is described as a white male, 22 to 28 years old, 5-foot-7 to 5-foot-8, and 130 to 145 pounds. The other suspect is described as a black male, 22 to 28 years old, 5-foot-10 to 6-foot-1, and 190 to 210 pounds. Experts warn that burglars turn to disguises and decoys to gain trust. Three men in Arizona offered to do yard work last fall until one of the suspects put the homeowner in a chokehold, according to police. The homeowner was dragged into his home with a gun to his head, according to police and a home surveillance camera. For the Delucias, the traumatic experience has caused them to start looking for a new home. "I fear for my life right now," Ida Delucia said. "I don't know who's going to come to my door."